Cui Bono, who gains? That is the question political analysts normally ask when someone does something unusual or out of the ordinary. 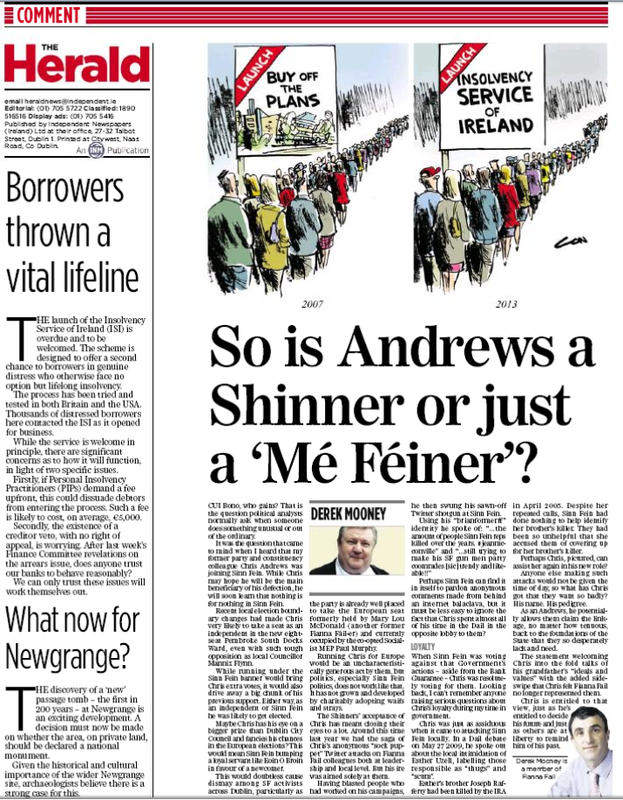 It was the question that came to mind when I heard that my former party and constituency colleague Chris Andrews was joining Sinn Féin. While Chris may hope he will be the main beneficiary of his defection, he will soon learn that nothing is for nothing in Sinn Féin. Recent local election boundary changes had made Chris very likely to take a seat as an independent in the new eight seat Pembroke South Docks Ward, even with such tough opposition as local Councillor Mannix Flynn. While running under the Sinn Féin banner would bring Chris extra votes, it would also drive away a big chunk of his previous support. Either way, as an independent or Sinn Féin he was likely to get elected. Maybe Chris has his eye on a bigger prize than Dublin City Council and fancies his chances in the European elections? This would mean Sinn Féin bumping a loyal servant like Éoin Ó Broin in favour of a newcomer. 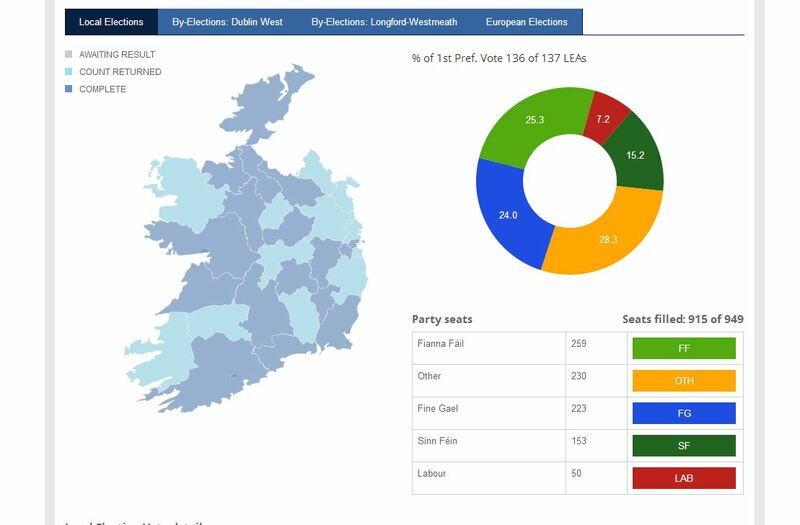 This would doubtless cause dismay among SF activists across Dublin, particularly as the party is already well placed to take the European seat formerly held by Mary Lou McDonald (another former Fianna Fáil-er) and currently occupied by the co-opted Socialist MEP Paul Murphy. Running Chris for Europe would be an uncharacteristically generous act by them, but politics, especially Sinn Féin politics, does not work like that. It has not grown and developed by charitably adopting waifs and strays. The Shinner’s acceptance of Chris has meant them closing their eyes to a lot. Around this time last year we had the saga of Chris’s anonymous “sock puppet” Twitter attacks on Fianna Fáil colleagues both at leadership and local level. But his ire was not aimed solely at them. Perhaps Sinn Féin can find it in itself to pardon anonymous comments made from behind an internet balaclava, but it must be less easy to ignore the fact that Chris spent almost all of his time in the Dáil in the opposite lobby to them? When Sinn Féin was voting against that Government’s actions – aside from the Bank Guarantee – Chris was resolutely voting for them. Looking back, I can’t remember anyone raising serious questions about Chris’s loyalty during my time in government. Chris was just as assiduous when it came to attacking Sinn Féin locally. In a Dáil debate on May 27 2009 he spoke out about the local intimidation of Esther Uzell, labelling those responsible as “thugs” and “scum”. Esther’s brother Joseph Rafferty had been killed by the IRA in April 2005. Despite her repeated calls, Sinn Féin had done nothing to help identify her brother’s killer. They had been so unhelpful that she accused them of covering up for her brother’s killer. Perhaps Chris can assist her again in his new role? Anyone else making such attacks would not be given the time of day, so what has Chris got that they want so badly? His name. His pedigree. As an Andrews he potentially allows them claim the linkage, no matter how tenuous, back to the foundations of the State that they so desperately lack and need. The statement welcoming Chris into the fold talks of his grandfather’s “ideals and values” with the added sideswipe that Chris felt Fianna Fáil no longer represented them. Chris is entitled to that view, just as he’s entitled to decide his future and just as others are at liberty to remind him of his past. My column from today’s Herald on the current discussions to have directly elected mayors for Dublin in the future. 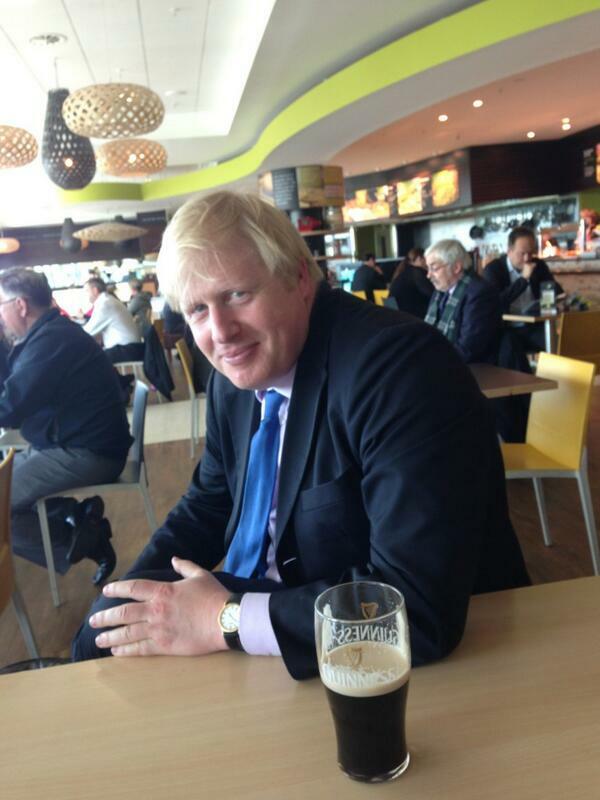 Should Dublin have its own version of Boris Johnson? That is the question a Forum of 22 Dublin councillors will consider between now and September. But there is good news: Dubliners will get a say on it in May. While the forum, drawn from the four Dublin Councils, started its deliberations at the end of July, the idea of Dublin having a directly elected Mayor goes back much further. According to the Lord Mayor of Dublin website it goes back to Chapter 11 of Minister Phil Hogan’s June 2012 local government reform: Putting People First. It actually goes back to Noel Dempsey’s 2001 Local Government Act. 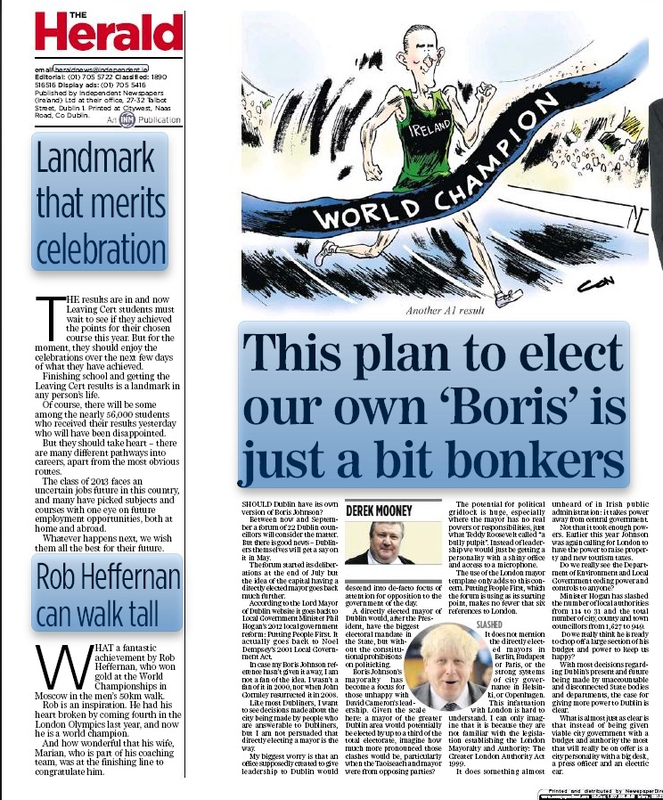 In case my Boris Johnson reference hasn’t given it away, I am not a fan of the idea. I wasn’t a fan of it in 2000, nor when John Gormley resurrected it in 2008. Like most Dubliners, I want to see decisions made about Dublin being made by people who are answerable to Dubliners, but I am not persuaded that directly electing a mayor is the way. My biggest worry is that an office supposedly created to give leadership to Dublin would descend into de-facto focus of attention for opposition to the government of the day. A directly elected Mayor of Dublin would, after the President, have the biggest electoral mandate in the State, but without the constitutional prohibitions on politicking. Boris Johnson’s mayoralty has become a focus for those unhappy with David Cameron’s leadership. Given the scale here: a mayor of the greater Dublin area would potentially be elected by up to a third of the total electorate, imagine how much more pronounced those clashes would be, particularly when the Taoiseach and Mayor were from opposing parties? The potential for political gridlock is huge, especially where the Mayor has no real powers or responsibilities, just what Teddy Roosevelt called “a bully pulpit”. Instead of leadership we would just be getting a personality with a shiny office and access to a microphone. The use of the London Mayor template only adds to this concern. Chapter 11 of Putting People First, which the Forum is using as its starting point, makes no fewer that six references to London. It does not mention the directly elected mayors in Berlin, Budapest or Paris, or the strong systems of city governance in Helsinki, or Copenhagen. This Ministerial and Departmental infatuation with London is hard to understand. I can only imagine that it is because they have never seen the legislation establishing the London Mayoralty and Authority: The Greater London Authority Act 1999. At almost 500 pages it is the longest piece of legislation passed at Westminster since the Government of India Act. More importantly it does something almost unheard of in Irish public administration: it takes power away from central government. Not that it took enough powers. Earlier this year Johnson was again calling for London to have the power to raise property and new tourism taxes. In May last year 8 out of the 10 UK cities asked if they wanted a directly elected Mayor said: no. Do we really see the Phil Hogan’s Department of Environment ceding power and controls to anyone? This is the Minister who, in the same Putting People First document, has slashed the number of local authorities from 114 to 31 and the total number of City, County and Town councillors from 1,627 to 949. Do we really think he is ready to chop off a large section of his Budget and power to keep us happy? With most decisions regarding Dublin’s present and future being made by unaccountable and disconnected State bodies and departments, the case for giving more power to Dublin is clear. What is almost just as clear is that instead of being given viable city government with a budget and authority the most that will really be on offer is a city personality with a big desk, a press officer and an electric car.